Lately one of our newest and most popular drum finishes in a very versatile kit. This kit is a Standard Series maple kit (6ply toms and 8ply kick) in Brilliant Blue Burst Satin Stain which is a bright medium blue stain that fades to a rich black. Sizes include a 16×20″ kick drum, 8×10″ and 8×12″ rack toms, and a 12×14″ floor tom on a DSS suspension cradle. Great sizes for any style of player. This kit sounds warm and full of resonance due to the thinner shells and our CT bearing edges. All chrome hardware includes 1″ mini tube lugs inline, 2.3mm triple flanged hoops, pro spurs, DSS suspension mounts and floor tom cradle, air suspension floor tom legs, pro spurs and Remo drumheads. 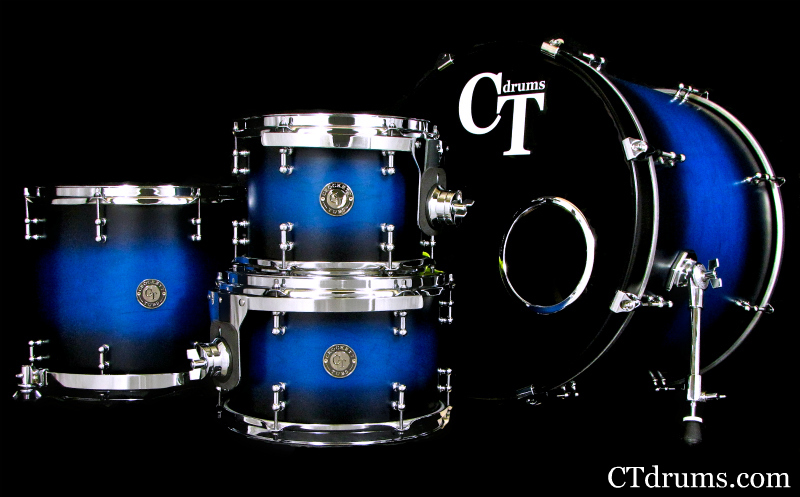 Posted on February 9, 2012, in Kits, Standard Series and tagged 12x14", 16x20", 8x10", 8x12", brilliant blue burst, chrome, drum kit, floor tom cradle, kit, satin, stain, standard series. Bookmark the permalink. Leave a comment.